Can Bike Racers Run Fast? Saturday is the Kiawah Half Marathon for thousands of runners. But to me, Saturday is experimentation day. The day where I will turn on the gas, and see how many pistons fire. Let’s back up though. Nevermind that your wife doesn’t race bikes. Nevermind that she didn’t stipulate what type of race, where, when, what season, the distance etc. I blindly and happily agreed. It was a dangerous act of faith on my part. My life was now in her hands. Thankfully, she likes to run and didn’t ask me to do something crazy like an adventure race. A few months back she came to me, asking if I would do the Kiawah Half Marathon with her. That sounded benign enough, I’d raced a half marathon before, and it was ONLY 13 miles. Without a thought, I agreed. Now, Fall is my favorite season, and also happens to be the off-season for bike racing. So I must admit, I didn’t think much about running until mid-October. With 8 weeks or so left till race day, I started shaking things out a bit and going for a run here and there. And that’s when I found out the bad news. Running is a cardiovascular sport just like biking, and they both involve using your legs. Which is precisely where the similarities end. My bike fitness was NOT transferring to running. At all. I started to wonder how big of a training mistake I had made by putting off runs as long as I had. Would I be able to run the whole thing? Should I adopt some sort of run-walk-run strategy? Why can’t I run faster than this? The questions streamed in. But I kept running. Happy with my observations and new found insights on myself, I went onward. A few more runs here, a few more there. 12 total runs into my training put me 10 days before the race. I could now run 6 miles with ease and was feeling more steady/confident with my stride and form. We went out for a nice long easy run. My goal was 9 miles, as I assumed that would be my longest run before the race. In bike racing, I know that my body is able to rebuild and benefit from long training rides 10 days or so after I do them. So I only assumed it to be the same for running. I decided to make this run a bit of a test. Often when I’m training for 4 to 8 hour mountain bike races, I will ride steady for the first 2-3 hours and hit some hard intervals in the final hour to simulate the rigors of racing. Given this half would hopefully be lasting 2 hours or less, I thought I would run easy for a while and turn it on for the final 3 miles to see how my body felt. We split ways at mile 6 and I throttled things up. My legs were loaded at this point and fatigue was there. But I noticed no aches or pains developed, much to my surprise. In fact, I felt like I was on my first mile of the run. Cadence was smooth, energy was strong, so I pushed faster. Then I hit it, the imaginary line. I had discovered this weird hiccup in my fitness while running. On a bike, I can hit a climb and go harder and harder, increasing my effort until I literally fall off the bike, and my heart rate follows at a mostly linear rate. But when I run, as soon as I cross over into zone 5, or into my anaerobic zone, I have no throttle. I hit a certain speed and can’t go any faster. My heart rate will go up, but my pace won’t increase. So I deduced it was simply a lack of miles, efficiency and running fitness. My quest then, had been to find the very edge of that line, and learn to stay right beneath it. 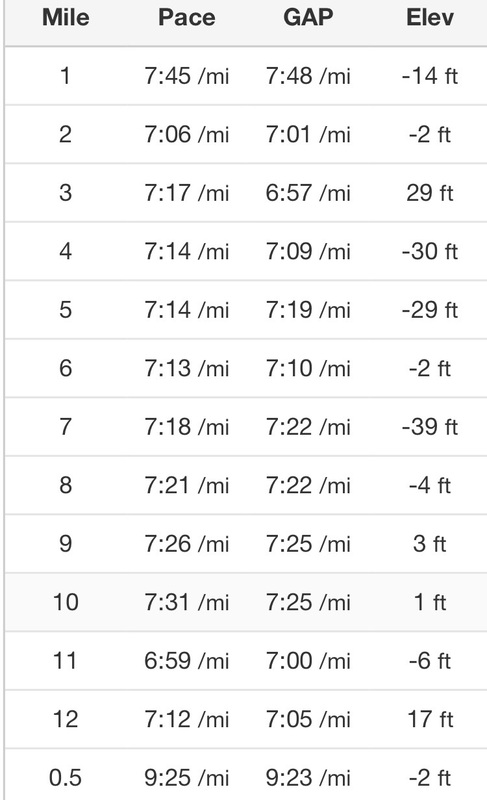 I closed out the run with those 3 fast miles and learned more helpful things about body. My preexisting bike fitness was FINALLY merging with my running, and finishing a sub-8 minute mile no longer felt like death. Progress. Saturday came, and we were 1 week from race day. We went out to do another long run, this time on flat terrain to simulate race conditions (Kiawah is pancake flat apparently). We mapped out a route and hit the road, running our own paces. I got out there and started looking for that line. Feeling it out, checking my heart rate. I was running smooth and fast (for me) and found a comfortable spot in the 170-173 bpm range. I sat there for the whole run and finished up doing 12 miles. I kicked it the last two miles as best as I could but couldn’t drop the pace much. Oh well. With 12 miles in the bag, I was relieved. I COULD finish this race and do it at a solid pace. But what about execution? There are no nerves on a training run, no overthinking things and making a mistake. You just go out and see what happens. There are tons of variables (like FOOD!) that I have yet to figure out! That makes me nervous. The safe bet is to simply do what I always do before races and hope my body thanks me for the same old system its used to. With only 24 hours to go, I’m excited to try this running thing out again and see how it goes. The hay has always been in the barn it seems, but finding how to open the barn doors has definitely been a journey. We’ll see if the barn keeper lets me pull out some hay on Saturday! UPDATE: It went really well!